sorry things are quiet on here – i’m trying to empty the freezer as it desperately needs defrosting, which means we are eating lots of things which i’ve already blogged about. things such as my mustardy mackerel fishcakes, vegetable shepherd’s pie, chilli and lentil ragu. there has also been a couple of packs of pastry which needed using, one of which was turned into this chocolate pecan tart. i used a full 100g of chocolate and chose a bar that contained cocoa nibs and coffee which added an extra layer of flavour. thinly roll out the pastry on a lightly floured surface until it is a little larger than your baking tray. transfer to the baking sheet and fold 2cm of the edges over to create a double thickness rim. press the rim down firmly into the pastry base with your fingers. prick the base of the pastry with a fork and bake for 18-20 minutes until well risen. remove from the oven and reduce the heat to 150°c. put the maple syrup, butter and sugar in a saucepan and heat gently until the butter has melted and the syrup is very hot but not boiling. remove from the heat and stir in the chocolate. leave until melted, stirring frequently.beat in the eggs and then the nuts. turn the filling into the pastry case. 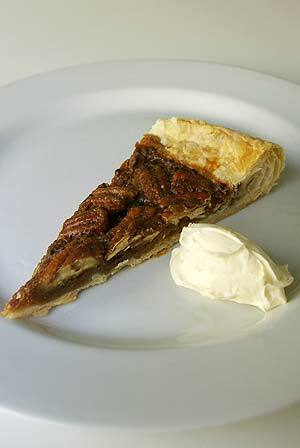 brush the edges of the pastry with maple syrup. return to the oven for a further 20-25 minutes until the filling is just beginning to set. serve warm or cold with cream.